About half the jobs at a Scottish legal firm which has entered administration could be saved as its business is transferred to other companies. 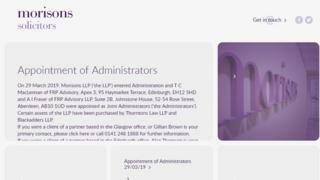 Morisons LLP , a legal partnership with offices in Glasgow and Edinburgh, was founded in the 1860s and employed more than 80 people. Its Glasgow business will now be taken over by Blackadders and its Edinburgh business by Thorntons. Administrators hope that about 45 staff positions will be saved in total. There are no plans for immediate redundancies. Lorna Jack, chief executive of the Law Society of Scotland, said: "We are very sad to hear that Morisons has gone into administration. "It represents the loss of a highly regarded Scottish law firm operating in Glasgow and Edinburgh." Ms Jack said significant change in the sector as well as the challenging economic environment continue to have an impact on law firms. But she added: "We are confident that arrangements are being put in place to ensure that there is as little disruption as possible for the firm's clients. "We will work with the firms to help ensure a smooth transfer of and provide advice and support for our members. "Morisons' clients should continue to contact their solicitor about any ongoing business or transactions." The deals, which are for an undisclosed sum, see eight Morisons partners and 41 staff transferring to Thorntons. In addition three partners and 30 staff will transferring to Blackadders. A further three partners are moving to different firms. There will be no immediate redundancies but both Morrisons and Thorntons will be reviewing their staff structures and requirements. A redundancy consultation period with some former Morisons staff will commence next week. Tom MacLennan, partner at FRP Advisory and joint administrator, said: "We are pleased that Thorntons and Blackadders have agreed deals to acquire certain assets, goodwill and work-in-progress of Morisons, thus ensuring continuity of client service, preserving employment and safeguarding client service. "We wish the newly enlarged businesses every success."